Three Arab terrorists shoot at policemen near Old City's Lions Gate, killing two policemen and injuring a third. Two police officers were murdered on Friday morning in a terrorist shooting attack on the Temple Mount in Jerusalem, and a third was lightly wounded. The officers have been identified as Command Sergeant Major Hayil Satawi and Command Sergeant Major Kamil Shanaan. Shanaan, 22, lives in the northern Druze town of Hurfeish, and has served as a career police officer since his enlistment seven months ago as a patrol officer on the Temple Mount and in the Old City's police unit. He is the son of former Labor party member Shachiv Shanaan. He left behind one brother and three sisters. Both officers were critically injured and transferred to Hadassah Hospital on Mount Scopus, where the doctors were forced to declare their deaths. The officer who was lightly injured was transferred to Shaarei Zedek Hospital, with shrapnel in his hands and neck. The funeral of Satawi will be held in Maghar at 4:00p.m. Shanaan's funeral will be held in Hurfeish at 6:00p.m. Initial investigations showed that three terrorists descended the Temple Mount after prayers armed with weapons and walked towards the Old City's Lions Gate. Seeing the police officers, the terrorists fired, then ran back towards the mosques on the Temple Mount. Police officers chased them and eliminated the terrorists during a shootout. The terrorists were found to have two pistols and a rifle. During the gunfight, Satawi and Shanaan were critically injured and transferred to the hospital, where doctors were forced to pronounce their deaths. 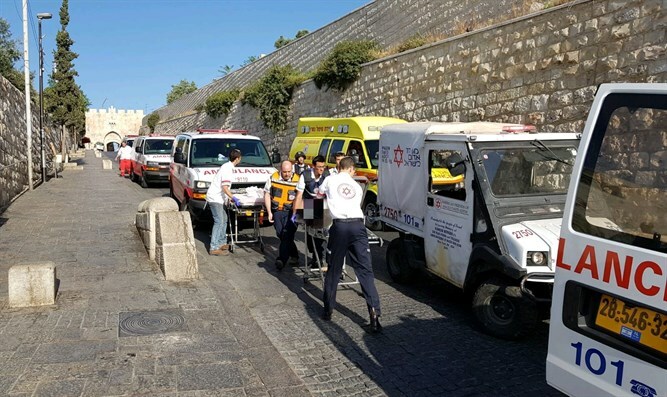 The Jerusalem District Command ordered the Temple Mount evacuated and its gates closed until the investigation of the attack is finished and the search for additional terrorists and weapons completed. The terrorists who carried out the attack were Israeli-Arabs with full citizenship and residents of the Arab town of Umm al-Fahm in the Haifa Disctrict, in the Wadi Ara area known as "the triangle" of Israeli Arab villages. Their names are Mohammed Ahmad Muhammad Jabbarin (29), Mohammed Hamed Abad Alalatif Jabbarin (19), and Mohammed Ahmad Mafdil Jabbarin (19). According to the Shabak (Israel Security Agency), none of the terrorists had been previously involved in terrorist activities. Details of the investigation itself are under a strict gag order.